As economists and policy wonks debate the merits of U.S. export financing, critics of one controversial program are warning of more subtle consequences exemplified, they say, by one of the president’s golfing buddies. 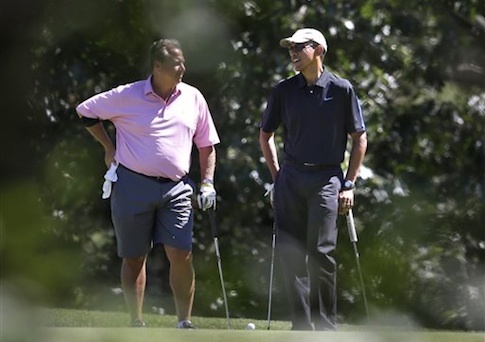 Robert Wolf joined the president on the links this month in Martha’s Vineyard, the latest of his frequent outings with the president. The foursome also included private equity financier Glenn Hutchins and Cyrus Walker, cousin of White House adviser Valerie Jarrett. Wolf’s deep ties to the president are integral to his business model. He is part of a rising industry of "political intelligence" professionals who use relationships with Washington power brokers to advance public policy beneficial to their clients. Wolf is the founder and chief executive of 32 Advisors, which describes itself as "the pre-eminent cross-border business advisory firm servicing domestic and international corporations, public entities, governments, financial services firms, and high growth businesses." 32 Advisors, which did not respond to a request for comment on this story, helps its clients secure various forms of federal backing, including financing for the export of their products. Those services involve Wolf in the ongoing debate over the Export-Import Bank, which finances the purchase of U.S. exports by foreign governments and corporations. Wolf is a major Ex-Im supporter. But unlike more academic or policy-oriented defenders of the program, he has a direct financial interest in keeping U.S. export subsidies flowing. His ability to sign clients depends, in part, on the continued availability of federal export financing for him to secure. It also depends on his ability to actually secure that financing. To that end, 32 Advisors has recently beefed up its staff with executives with strong Ex-Im ties, some of which have served in senior positions for the agency. Wolf’s ties to the Obama administration go back further. He first met the then-Senator in New York City in 2006. Liberal billionaire George Soros had gathered together a team of Wall Street executives who, Obama hoped, would help bankroll his yet-to-be announced presidential run. Wolf had established his bona fides as a Democratic fundraiser in the 2004 and 2006 election cycles. He gave Obama his card and the two began corresponding—and, on occasion, meeting in person. He would eventually raise half a million dollars for Obama’s campaign. Four years later, he would bundle another half-million, and personally max out to the president. Like many Obama bundlers, Wolf was rewarded with a federal appointment. He was selected to sit on the president’s Economic Recovery Advisory Board, which advised the White House on the disbursement of federal stimulus funds and other policies related to economic recovery. Wolf was then the chairman of Swiss banking giant UBS’s operations in the Americas. His close relationship with Obama grated on some of his colleagues, including UBS Americas’ CEO, who felt Wolf’s quest for the spotlight was undermining his authority. In July 2012, Wolf left the bank to form 32 Advisors, and made sure to inform Obama of the move. "I had the ability to speak with him numerous times about what I’m doing. He saw my excitement, he was excited," Wolf said, according to a New Republic report. "The relationship [with Obama] goes way back. Obviously, we’re very friendly. We remain close friends," he added. After Obama’s reelection, he was tapped for another federal post. Since June of last year, he has sat on the President’s Export Council (PEC). That work has dovetailed well with his focus on export financing at 32 Advisors. In that capacity, Wolf has been highly supportive of the Ex-Im Bank. "I meet with CEOs around the globe daily and the EX-IM reauthorization is coming up now every day," Wolf told the president at a June PEC meeting. "They don’t understand the debate." A failure to reauthorize the agency would be "unconscionable," he said. 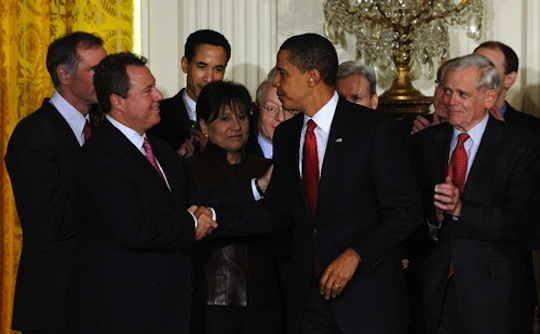 He presented the president with a letter from the PEC extolling Ex-Im’s financial benefits to American businesses. The remarks came a month after 32 Advisors hired former Ex-Im vice president John Schuster. The hire "will prove to be extremely valuable for the firm's clients," Wolf said in a statement at the time. The year before, 32 Advisors had picked up Kevin Varney, the former senior vice president and chief of staff at Ex-Im. Months later, it hired Carter Lawson, the agency’s former deputy general counsel. Its biggest hire, though, was Austan Goolsbee, the former chairman of the president’s Council of Economic Advisors. Brought on last year, Goolsbee is a "strategic advisor" to the firm. In May, 32 Advisors announced the formation of a subsidiary focused on advising clients on the use of unmanned aerial drones. Measure, as the company is called, lists four employees, all of whom have been deeply involved in government relations and the federal procurement process. 32 Advisors and its Measure subsidiary are eyeing business opportunities for which its connections to top Obama administration policymakers will come in handy. Wolf participated in the White House’s recent U.S.-Africa Leaders Summit, and told Bloomberg in an interview that the conference presented numerous potential business relationships for his firm. "The opportunity is incredible," he said. Wolf’s critics say many such opportunities are only available to him because of his deep ties to Obama and other high-ranking administration officials. Barney Keller, the communications director for the conservative Club for Growth, a leading Ex-Im critic, pointed to his advocacy for the bank’s reauthorization as a perfect example. The agency "exists primarily to benefit those who can hire the most well-connected lobbyists and is nothing more than a symbol of corporate cronyism that should be eliminated completely," Keller said. Wolf "is just another example of why Americans are fed up with corporate welfare slush funds like the Export-Import Bank," he added in an email. The Club for Growth and other Ex-Im critics say the bank inflates its economic value to the country. But they also point to a more intangible effect problem that they say Ex-Im and similar programs exacerbate. That problem is personified in the rise of the "political intelligence" industry, they say. Many former Obama administration officials, while certainly not the first to cash out on their public service, have leveraged their ties to the president into six-figure gigs at high-powered DC lobbying and public affairs shops. Critics say programs like Ex-Im give the politically connected a way to earn a living simply off of knowing the right people. Wolf is quick to downplay the benefits of his connections—"The president has other things to do than worrying about 32 Advisors," he has said—but he makes sure his clients are aware of those connections, frequently touting his administration work and close ties to the president on 32 Advisors’ website. This entry was posted in Politics and tagged Barack Obama, Ex-Im Bank, George Soros, Obama Administration, Robert Wolf, White House. Bookmark the permalink.